Ten years ago I was six months out of an Acute Psych Ward after two psychotic episodes, and was just beginning the process of cutting down the medication I’d been given after a diagnosis of bipolar. The emotional pain of being dumped by my fiance was still fresh and raw, and I’d only just stopped sobbing my heart out every day. Not that I was crying only about our break-up. The psychosis had ripped open decades of unexpressed emotion plus the spiritual awakening I’d had at the same time had woken me up to the collective weight of humanity’s suffering. When I cried, it wasn’t just crying for me, but for every man, woman and child who had ever suffered and would ever suffer. Crying was a full-body experience that involved vomiting up great buckets of tears and was best down in the shower, which would both drown out the sound so other people didn’t freak out, and also wash me clean inside and out at the same time. Added to this grief, I was on a sickness benefit and I was $20,000 in debt. I had zero interest in worldly matters, in ‘working for a living’, in consumerism and materialism, in partying or in socialising. All I cared about was understanding the experience I had been through, figuring out what I needed to heal, practicing yoga, and healing. I’m in the seventh year of publishing New Zealand’s most popular yoga website, which continues to go from strength to strength. I’ve published two yoga books which have both been favourably received. Thousands of people have used my Forty Day process to create and maintain a home yoga practice. Over a million (!!!) people have read my articles. 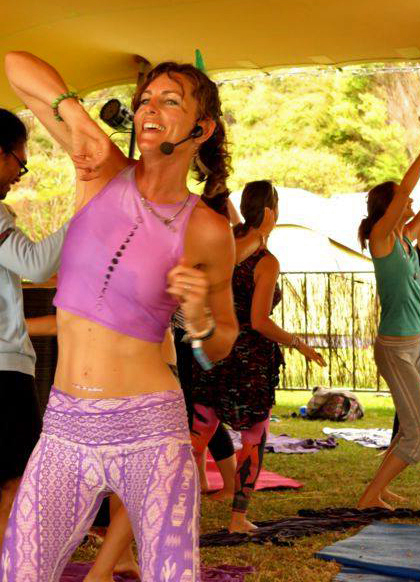 I’m teaching yoga through Yoga Rhythms in a way which feeds my soul and touches my heart. I have a beautiful five year old son who amazes me with his presence in my life. My relationships with my family and friends have never been better, and continue to deepen and grow. I feel extraordinarily blessed as I am everything I ever visioned, and more. Ten years ago, when I would struggle to even get on my mat and sob my way through a practice, this was the life I wanted to lead. This is who I wanted to become. How did I get here? Through the practical application of yoga on a daily basis. I learned how to live my yoga and therefore rock my life. This means that I didn’t just go to yoga class a few times a week, or even five times a week. It means that I didn’t just do a physical sequence at home a few times a week, or even every day. It means that learned how to use particular yoga tools according to my needs and my lifestyle at that time. I have done practices to help me cultivate more loving-kindness in my life, practices to help me open my heart, practices for infinite energy, practices to remove obstacles from my life, practices to rebuild my identity and retain my mind, practices to improve upper body strength and practices to nourish and nurture me through the exhaustion of having a newborn. This process – of identifying a need, choosing a practice and then committing to it for a set time – is what’s brought me to where I am today. And I’m still using it – I’m on a new Forty Day practice right now. Of course, yoga is not the only thing I’ve done to facilitate healing and growth. I’ve also worked with a number of talented healers, seen counsellors when necessary, cultivated deep friendships that support healing processes and worked with western medicine when necessary. Yet my practical application of yoga has been the scaffolding that has held everything together. It’s the foundation of my life, and the way I live my life. This is the key. It’s no use learning the yamas, like asteya, if we don’t explore what it means to apply that in our life. If we’re working under the table and avoiding paying tax, how does that relate to asteya? If our yoga classes often start late or run late, how does that relate to asteya? Or conversely, if we’re dealing with increasing stress in our lives and find ourselves getting anxious on a regular basis, what practices could we do that would support our mental health at this time? Through this practical application of Yoga in our daily lives it becomes something that can provide nourishment, nurturing, support, and bring us home to ourselves. It’s one more tool in our toolbox, along with everything else we do to support out healing and growth. Yoga is not, and will never be, a cure-all. It’s not a magic bullet that if just applied in the right way and with the right dedication can fix us or make us better. However, it can make an enormous difference in the quality of our lives, and used in the right way it can help us set goals and become that which we already are (underneath all the doubts, fears and insecurities). Thanks so much for your message. It’s wonderful having you in my classes and watching the practice deepen in you! I’ve realised that all the difficult experiences I’ve done through have been so necessary and valuable for my training as a teacher. I needed to go deep into the darkness so that I can deeply understand and feel the suffering of other people, and help lead them back into the light. So I’m happy about them too!